Friday, February 22, 2019 from 8-11 pm. Westwood Country Club (800 Maple Ave E. Vienna, VA) in the main ballroom. How much are tickets? And what is included? Tickets are $125. Your ticket includes 2 drinks (beer & wine), hors d’oeuvres, raffles, photo booth, music, swag bags and a whole lot of fun. Donations of new with tags bras and underwear as well as unopened packages of tampons and pads are greatly appreciated. Yes! We offer many opportunities for you to support our mission and obtain excellent media exposure for your organization! All sponsors include exclusive VIP early entrance to the event! Click HERE for more info! No. There will be hors d’oeuvres, dessert, wine and beer, but if you want a heartier meal you may want to make a night of it and invite friends to dinner nearby before heading over. How/where do I purchase raffle tickets? Raffle tickets can be purchased online HERE or at the event. They’re sold in increments of 5 tickets for $20 cash or credit card. More info on raffle items being offered to come! We have tickets to see Ellen DeGeneres, the Nats, Caps, Wizards and a whole lot more! You don’t have to attend to participate in the Auction so please tell friends and relatives! I can no longer attend or I have a ticket I am no longer able to use. What are my options? We are very sorry, but we can no longer offer refunds. However, you are welcome to sell the ticket to a friend! Yes, there is parking at Westwood for your convenience. We would also encourage guests to use Lyft or Uber for safe, easy transportation. Click HERE to see a map and get more info. This may be our most popular question! Cocktail Attire! Here is your chance to wear that little black dress (or suit) you look so good in or it is a great excuse to go buy something new! Is this a ladies event or do husbands usually go too? Yes- it's a ladies night! and Yes- it's a couple's night too! Want to bring your husband? Great! Prefer to have a night out with just the ladies? That's great too! ​Do I need to print out a ticket? No- just check in at the registration desk. Please email us ahead of time with all the names of your guests. I can’t attend, but I would like to make a donation- Can I do that? Yes, of course! Click HERE! 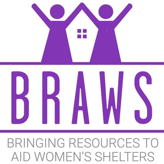 How do I get involved in volunteering with BRAWS?